Yan ke nikale huay to hain"
ek sada loh ka Barbad kar diya tere do din ke pyar ne"
Diwana kar diya hai ghame rozgar ne"
"ls it convincible that I should think of forgetting you, But the sorrows of the world have driven me mad'. He edited the famous Urdu Magazines 'ADAB-l-LATlF" and "Shakar". 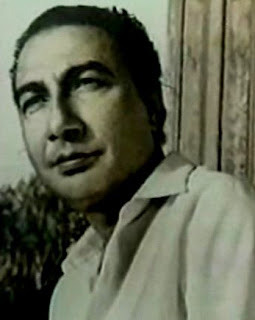 After the partition of the country he migrated to Lahore he edited the famous urdu bimonthly "Savera" One of the editorials criticizing the Government so infuriated the authorities that warrants for his arrest were issued. He fled to lndia, reaching Delhi were he stayed for a year. 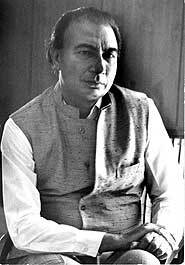 Then he moved to Bombay where the film world was waiting to be conquered by him. His mother who had been left in Pakistan was brought to lndia by his friend Parkash Pandit. Licentiousness of his sad as well as violently opposed to the established order. He could feel the privations and humiliation a suffered by countless millions through out the world. The bitterness of his mind flowed in painful yet exquisite songs. 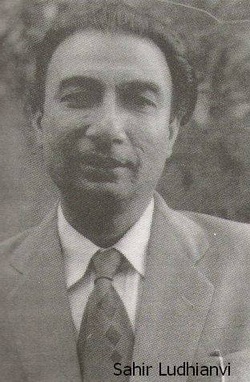 That is why his first collection of poems bore the title "TALKHAIAN" (Bitter moods). ("When women will not be sold for a handful of silver coins. 'Yeh jashan, Yeh hangame, dilchasp khitone hain Kuchh logon ki koshish kai kuchh log bahe jayen. "The commemoration of poet is nothing but source of entertainment Arranged by the cunning to distract the bored." Sahir's humanity is not confined to the nation's borders only. He suffers with the Africans, the Hispanics as well as with the Vietnamese opposed to the high handedness of the mighty. He believed in the freedom of all, big and small. On the Republic day, he asks the rulers of the country. yet the poor gain not a bit? What about the facilities for the common folk? Sahir was aware of the sins of masters of the world and with pen he too was fighting in the fron t ranks of those who stood for human dignity. As long as the spark of freedom glows in the human breast Sahir will live in peoples memories.